To coincide with the release of Majora’s Mask 3D a Majora’s Mask themed DLC for Hyrule Warriors was made available a couple of weeks ago. Along with this DLC came an update providing a higher level cap, more potion mixes, more medals to earn and other things. There is still one more DLC pack to be released and information on what it contains has been announced. Get the scoop and see some screen shots after the jump! 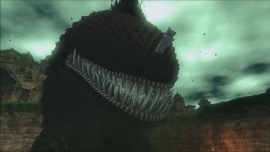 Daily Debate: What Kind of Boss Design Do You Expect in Zelda U? Gossip Stone: Will Ganondorf Return as the Villain in Zelda Wii U? Slowly, in one minute segments, A Link Between Worlds gameplay is being released to the Internet. It seems like we’ve gotten so many gameplay videos already that before the release next week the entire the entire 18 or so hours of A Link Between Worlds will be available to watch! Today we’ve got four videos to watch, including the full title opening! Hit the jump to see!